Anna Maria Island Florida Gulf Coast barrier beach and island shore living. Anna Maria Island real estate property is unique. Find out about building, buying, renting and selling on a Florida Gulf Coast barrier island, with the best Old Florida atmosphere and friendly natives. The north part of Anna Maria Island underwent major remodeling as a couple of large construction projects dominated the landscape in mid May. 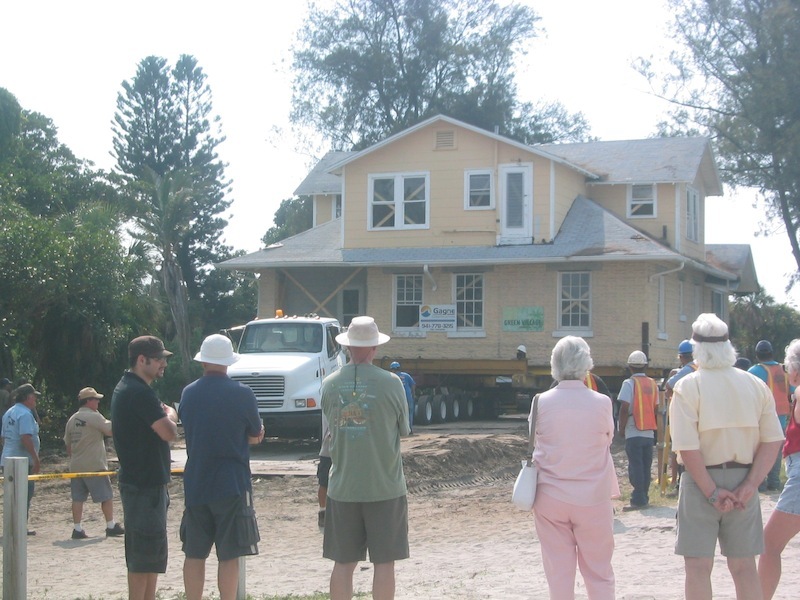 The most unusual project was the relocation of the historical Angler’s Lodge, which had sat on North Bay Boulevard for 97 years. 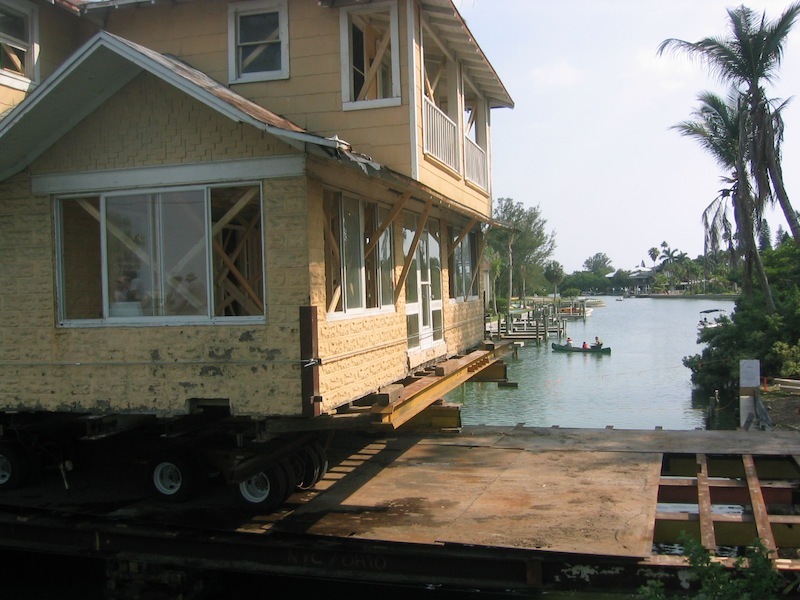 On May 23, a temporary steel bridge was built across Lake LaVista inlet, in order to move the 150-ton lodge to an empty lot on the other side of the water. The ultimate destination, the Historic Green Village on Pine Avenue, was to be reached the following day. The original plan was to start building the bridge by 7 am, and have the house moved across the water by noon. Not surprisingly, it took far longer … most of the day. This gave curious onlookers plenty of time to watch. The adjacent humpback bridge was filled with people all day. The Angler’s Lodge was built in 1913. Until 1950, the building was called “Thelma by the Sea.” Thelma was the name of the daughter of the builder, Mr. R. J. Wood. In the 1940s, the second floor was added, and soon after, the building was called Angler’s Lodge. This entry was posted in Real Estate and tagged Anna Maria City, Anna Maria City Pier, Construction remodeling, Historic Green Village on Pine Avenue, Historical Anna Maria Island, Thelma By The Sea on May 29, 2011 by Mike. Why buy a new refrigerator if the present one is still running after thirty years? And, not only that, when its “harvest gold” color is getting harder and harder to find. But seriously, one real reason to think twice before replacing such an old refrigerator is the fact that the life span of new refrigerators is so much shorter than new ones. A salesman at Best Buy recently told us to expect 5 years from current models. It’s amazing to realize that if we keep our old refrigerator we may get more years out of it, still, than we would out of a replacement. Yet we did spend quite a bit of time looking at new refrigerators at the beginning of summer. Life expectancy was not the only shock. The new refrigerator models look so appealing that it’s easy to forget about certain important details. For example, my initial first choice looked worth getting until we realized that the door had room for only one full-sized gallon drink container, and the shelves did not have enough clearance to put standard-sized drink containers there. And the shelves were not adjustable. At this point, our old fridge still was preferable to the newer option. Quieter cooling systems and energy efficiency are important features of new refrigerators. Certainly, we would save a lot of money in our annual electric bill if we had a new refrigerator. As we started checking out more models in Bradenton Home Depot, Lowe’s and Best Buy, we made energy efficiency a top priority, looking for the Energy Star logo. We also wanted to consider having the freezer on the bottom instead of the top, thinking that would mean less bending for often-used items. This entry was posted in Real Estate and tagged appliances, refrigerator on August 30, 2010 by Mike. Residents and visitors of Anna Maria Island are finally coming out of a particularly cold winter. 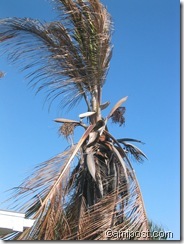 Sadly, that’s more than can be said for many of the beautiful palms that grace the island. Cold-hardy palms survived fine, and are completely green. But many coconut palms are looking very brown. The other evening we were alarmed to see in a neighbor’s yard that the entire head of a coconut palm had fallen over, and was just hanging. We have been staring at several of our own coconut palms. They are mostly brown now, and have dropped many of their fronds and coconuts. We think it’s very likely they will not survive, but since they are so tall, it’s impossible to see exactly what’s happening in the bud. A few of them still have signs of pale green in the newer fronds. To avoid attacks by primary or secondary plant pathogens, it is important that steps be taken to insure protection of the healthy bud until active growth resumes. 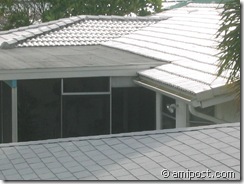 Remove the cold-damaged portion of the leaves. Leaves should not be completely removed if they are green (even if they are spotted from the cold). 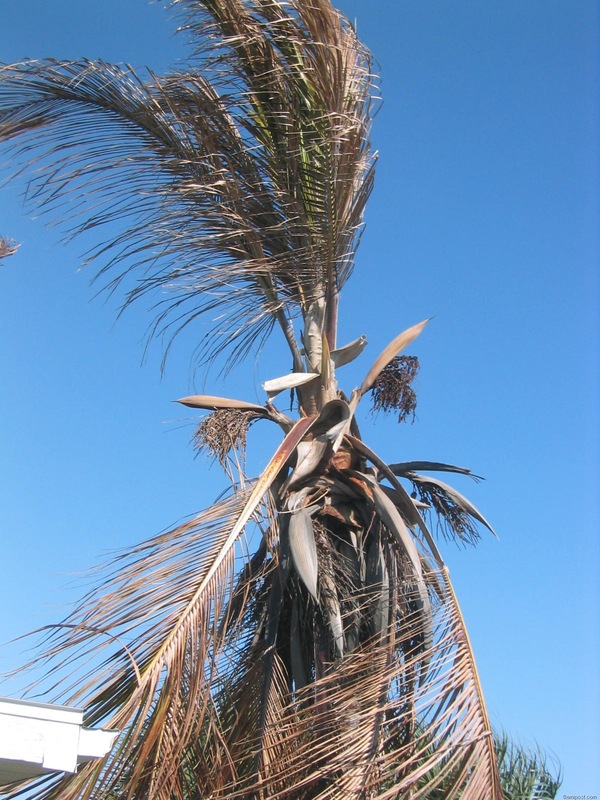 The green intact portions of the palm are important to assure adequate photosynthesis during the recovery stage. This entry was posted in Real Estate and tagged coconut palm, cold-hardy palms, tropical plants on March 31, 2010 by Mike. After many years of experimenting with Christmas tree options, I’m glad to be in a place where almost anything goes. This year I kept it very simple. Perhaps more than anywhere else in the nation, Floridians seem to find more variations on the Christmas tree than those who live in snow country. Since so many of the traditional Christmas symbols are not part of the Florida experience anyway, we may as well improvise and have fun with it all. 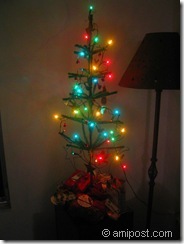 Before moving to Florida from Colorado, we found natural Christmas trees were affordable and a pleasure to bring home. 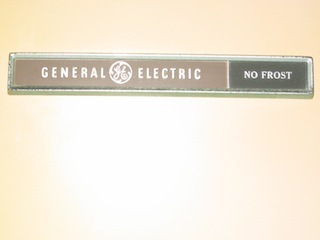 Usually, we bought a permit for a few dollars from the Forest Service, bundled up, and snow-shoed or cross-country skied through deep snow looking for trees that did not have a bright future, for example those growing directly under power lines. This was probably as close as it gets to the classic Christmas tree tradition. It was wonderful, and beautiful, but sometimes it was very cold and it usually took a lot of time. So we tried buying a live tree one year, which theoretically could be planted outside after Christmas, but that did not work well. I think it’s too much to expect the same tree to survive both indoors by the fire and then outdoors in a blizzard. Our timing in moving it was probably to blame. We had more success with a large indoor Norfolk pine, which grew in the sunspace that heated our mountain solar home. It had started in a local restaurant as a tiny Christmas table decoration, and had a crook in its trunk, making it a real Charlie Brown tree. But after years in our solarium, it had straightened and made an acceptable Christmas tree. This entry was posted in Real Estate and tagged Anna Maria Island homes, Florida pictures, Florida style on December 24, 2009 by Mike. It’s been a windy November, and this is just a reminder of how much windier it can be in years that we are more affected by tropical storms and hurricanes. It brings up the question of how hurricane-proof our houses are here. Anyone in the market for a house on Anna Maria Island should certainly pay close attention to the quality of the construction, starting with the roof. Anna Maria Island has been very lucky this 2009 hurricane season, as has the entire Atlantic region of the United States. Unlike some recent years, in which life on the island was interrupted frequently by approaching hurricanes, this year, it has been possible to almost forget these great storms are part of life here. By the middle of November, the only storm that came nearby was Hurricane Ida, which passed by with less interest than we’ve paid to any of the previous storms, such as Hurricane Bill in the Atlantic, earlier in the year. This entry was posted in Real Estate and tagged Atlantic hurricanes 2009, Home Owners insurance, insurance, Real estate, Roofs, Wind mitigation certificate, Windows on November 18, 2009 by Mike.